The leading companies aim to use the twenty-four hours in a day in the most effective manner. Considering the importance of core functions in a business, often the organizations outsource specific IT task or the entire IT function to utility service providers. These virtualization service providers are proficient in their field and can provide virtual IT services from any remote location. Wintellisys is one such IT service provider, we offer Cloud Computing, Azure Service, Virtualize Serve, IT Managed Services, Enterprise Mobility Service/ Virtualization Technology Service, and more! Alluring and retaining the customers are two imperative components for any business. Generally, entrepreneurs search for those strategies that will help their every client in every possible way. Some options, however, prove more fruitful than others like for small businesses virtualization technology service is astounding. Although, whenever we heard about virtualization, we assume that this service is only for big enterprises. Also, the perception exists that virtualization service is hard to implement, manage, maintain, especially for small business, as it requires much expertise and very expensive to take on. This type of perception is present among people because generally large enterprises come with large data centers and have the most to benefit from the technology. If you are looking for a technology that can benefit for both small and medium enterprises, then Virtualization is definitely the best option for you. A part of this, to dwindle many problems servers are the backbone of every successful business organization and without the support of servers, the business can never flourish. However, today, the business organizations are not opting for the physical servers, but are instead looking for virtualizations of their servers as it saves on time, investment and power. Physical servers are huge machines that use up a lot of space and power and the cooling costs of such machines are also substantial. Therefore, facing such situations, the best ways to move ahead the business would be to opt for virtualize server management. Another important factor which you look while taking any IT Service is Security. This is a major concern in all small and big companies. VMware hosting is the answer to making sure a business has dependable data protection. These high-tech data centers have superb backup facilities which are far more secure than something any workplace would have on their site. VMware hosting companies provide a data center that is high tech with exceptional backup facilities which in so doing will effectively secure data throughout any type of situation such as power failure. One can quickly transfer the data on a different virtual server. As well, it permits one access to the server at any time anywhere. Whatever problem your IT Company is facing, Wintellisys is the perfect place to resolve all the issues. 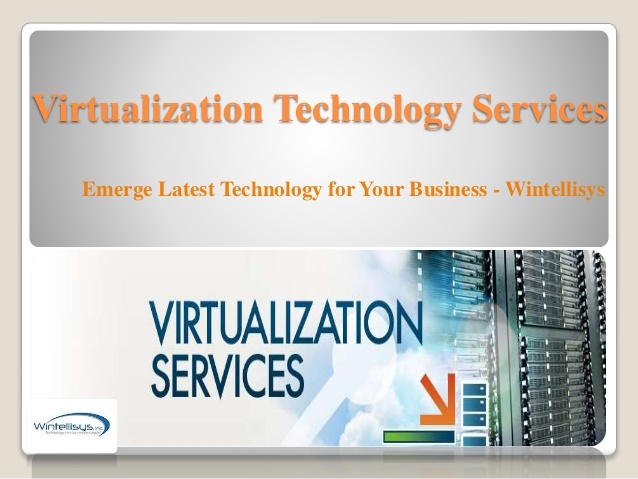 Whether you need a cloud computing service or just involve a Virtualization technology service. Here, you find a secured virtual environment that ensures to provide you greater results.